The limb can provide ‘near natural upper-arm extremity control’ to amputees and the device is modular so that it can be fitted to people who’ve suffered any degree of limb loss. WASHINGTON — A prosthetic arm made by a company founded by Segway inventor Dean Kamen has been approved for sale by U.S. regulators, who called it the first such device able to respond to multiple simultaneous commands from a wearer’s brain. Electrodes attached to the arm detect muscle contractions close to the prosthesis, and a computer translates them into movement, the Food and Drug Administration said last week. As many as 10 movements can be detected by the limb, which is the same weight and shape as a natural human arm. The company, closely held DEKA Research and Development Corp. of Manchester, N.H., developed the arm with financing from the Defense Advanced Research Projects Agency and the U.S. Army Research Office, according to DEKA’s website. The company nicknamed the arm “Luke,” after the “Star Wars” movie character Luke Skywalker, who receives a bionic hand after losing his natural one in a light saber battle with his father, Darth Vader. The DEKA limb can provide “near natural upper-arm extremity control” to amputees and the device is modular so that it can be fitted to people who’ve suffered any degree of limb loss, from an entire arm to a hand, Sanchez said. Six “grip patterns” allow wearers to drink a cup of water, hold a cordless drill or pick up a credit card or a grape, among other functions. 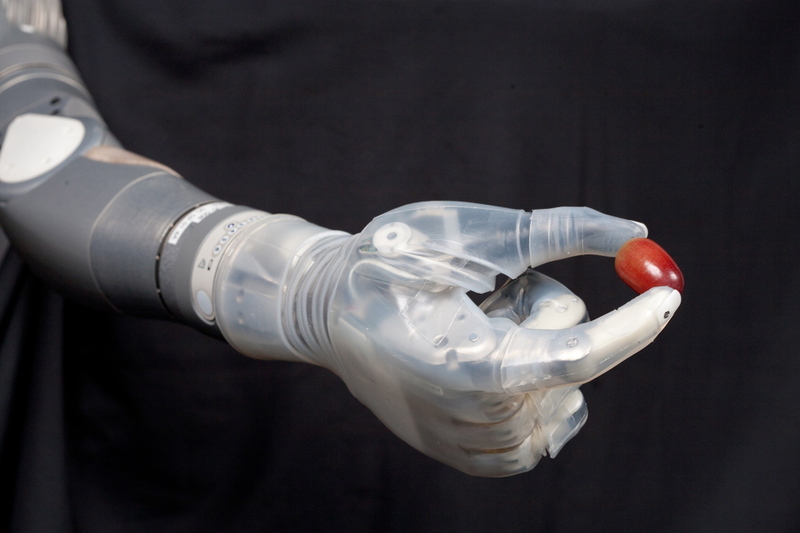 DARPA has given DEKA $40 million since 2006 to develop the arm, Rick Weiss, a spokesman for the agency, said by phone. DEKA owns the patents and commercial rights for the device. “Without that kind of money it would be difficult to attract the kind of people I think that we need to solve the problem we’re trying to solve,” he said. A DEKA spokeswoman didn’t return a phone call and email seeking comment on FDA’s approval. Kamen’s Segway is a two- wheeled electric scooter introduced in 2001. He also developed a water-purification device, the Slingshot, intended to help people in developing countries who don’t have access to clean water. The limb works by attaching electrodes to the surface of remaining arm or shoulder muscles, or to the legs of amputees, Albuquerque and Sanchez said. When amputees flex the muscles that would have previously been involved in moving their arm or fingers, the DEKA limb moves accordingly. “They don’t need to control the shoulder, the elbow and the hand; it’s all able to work together in one motion,” Albuquerque said. Alternatively, the limb can be controlled with leg movements, Sanchez said. Signals are transmitted wirelessly.